Coconut Crab (Birgus latro) (aka Robber Crab) is the largest land-living arthropod in the World. The enormous crab with large legs and big claws grows to a gigantic body length of up to 40 cm. (16 inch) with a leg span of about one metre (3.28 feet) and weighs up to 4 kg (8.82 pounds). Charles Darwin who had encountered these crabs on Keeling Islands described these crabs as monstrous. (Source: Charles Darwin's Zoology Notes – PP 311 Keeling Islands April 1836). These crabs are generally found in the various Islands in the Indian Ocean and Pacific Ocean especially those with lesser human population and higher availability of coconut trees. Their largest concentration is reportedly in the Christmas Island in Indian Ocean. 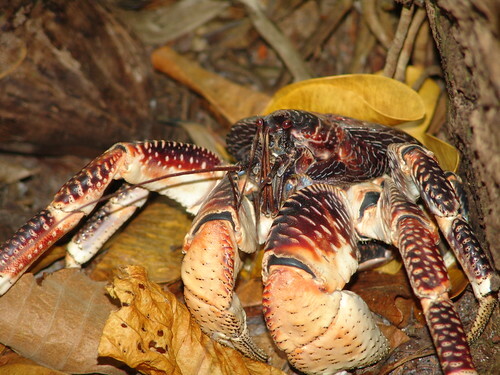 Although Christmas Island is famous for its Red Crabs with a population of more than 40 million, it is estimated that population of these crabs on the Christmas Island may be around 100,000. Its meat which tastes like a lobster is considered a delicacy. 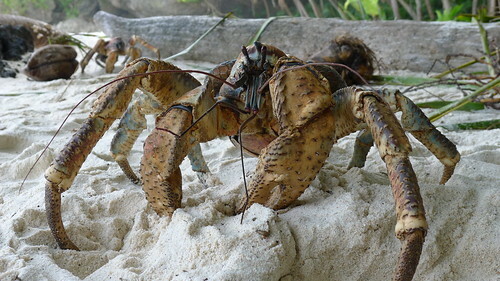 In addition to being hunted for food, quite a lot of these monstrous crabs are also killed in road accidents, especially in Christmas Islands, where several hundred crabs are run over each year by vehicular traffic. Although not yet on the protected species list, but in some regions/Islands it has been put on the threatened list. The crabs normally avoid contact with human habitat and do not pose a danger to humans but reportedly when threatened, they sometimes do retaliate in self-defence. Main diet of these crabs is fruits, nuts, seeds, and the pith of fallen tree, however these crabs love to eat the flesh of coconut, hence their name. They even climb coconut trees and break open coconut fruit with their strong claws. Although their staple diet is fruits, nuts etc. but given a chance these crabs eat dead flesh also. As per the latest theory propounded by the researchers at 'The International Group for Historic Aircraft Recovery' (TIGHAR) the flesh of famous lady pilot Amelia Earhart and her navigator Fred Noonan, who went missing while on a circumnavigational flight of the globe in 1937 and their wreckage was never found, was probably eaten by giant Coconut Crabs who also carted away some of their bones. (Source: Discovery News - Earhart's Final Resting Place Believed Found). Credits: I am thankful to Daniel Gayle for bringing to my knowledge these amazing crabs - Thank you Daniel.